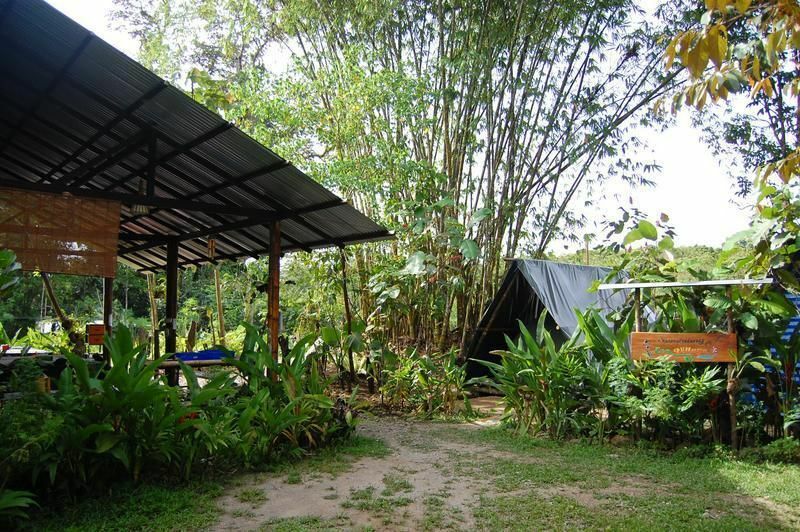 Sumbiling Eco Village is a nature lodge situated in the interior of the Temburong District, home to some of the best preserved rainforests in Borneo. Due to our location, we are within reach of the popular Ulu Temburong National Park as well as other well-preserved rainforest areas, yet just 5 mins walk to the main road, 25 mins drive from Bangar (Temburong main town), and around 2 hours by boat and drive from the Brunei International Airport.A rustic stay awaits you, as our lodge is surrounded by shady trees and new growth forests, and is located right on the banks of an upstream stretch of the Temburong River, with rocky rapids, and clear water depending on the rainfall. We try our best to keep structures to a minimum, with huts built from bamboo as well as reused and new wood being the main theme. On a typical day, while away the afternoons on cosy hammocks under shady trees beside the river, and take time to finish that intriguing novel you have never quite managed to finish. When the heat gets to you, the cooling waters of the river await, though if a mere cool dip doesn't do it, try a downstream float in a rubber tube, or try your hand at a traditional bamboo raft. Then as the sun sets, tune in to the symphony of the night, with the sounds of insects, frogs and other wildlife never too far away. 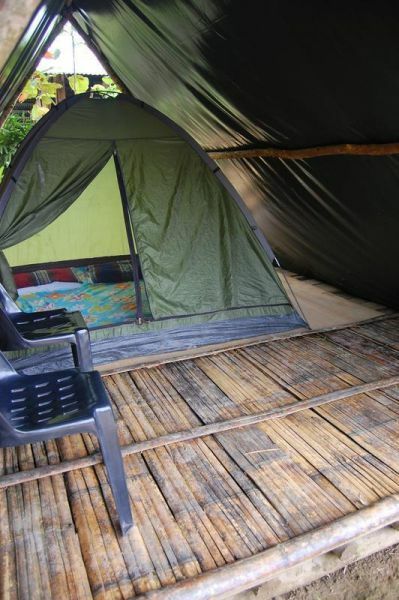 This is the place to rest, relax and have some simple outdoors fun, especially if you have been worn out on the road for the last few weeks or months.For those who want more and whose budgets permit, we also conduct optional excursions, such as a night walking tour, or a daytrip either to the Ulu Temburong National Park or the Rainforest Discovery trek into the nearby rainforest, a hands-on see, smell, taste and feel educational trek for those who are interested in the numerous benefits of the rainforest to us.Despite the back-to-basics approach and our proximity to the rainforest, we provide a reasonably comfortable stay, with bedding in both rooms and tents, properly built-up bathrooms, with sitting toilets and even walled outdoor showers. Fans are found in the rooms as well as in the main hall. The bathrooms, rooms and main hall are lit-up at night, and there is no early lights out policy. Power points to charge electronics are available on request. We have a small resource corner, with maps, brochures, and books on various interests.Price include: Transportation from Bangar Jetty in Temburong District and also include full board mealsTerms and Conditions:We only accept balance of payments in CASH in either Brunei Dollars or Singapore Dollars (except for S$1 coins and soiled or torn notes, no matter how small the tear).Our kitchen is not available for guest use. meals are NOT included in your tent or room booking. No restaurant. 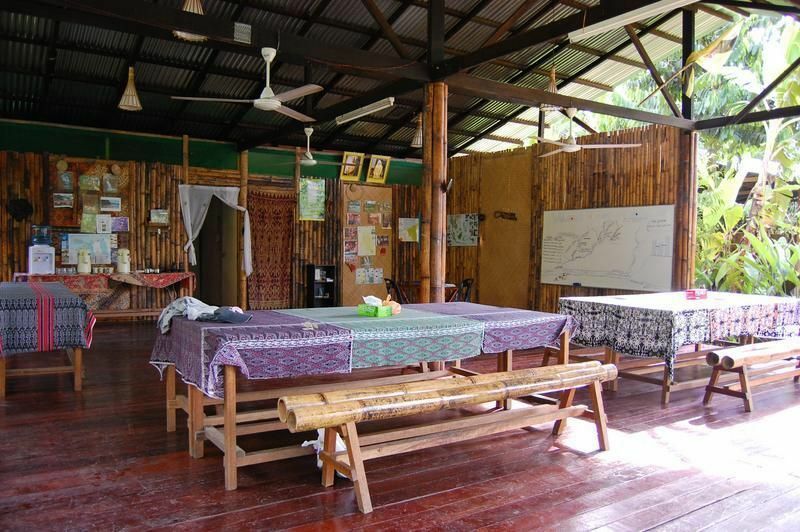 Nearest convienience rural shop is 5 KM away from Eco Village.However, we can provide simple meals,consisting a dish and steamed rice (a breakfast, a lunch and a dinner per booked night) at additional B$20/person. Please email us at sales@borneoguide.com for the meals package( B/L/D).There are currently no marked forest trails, so we do not permit leisure walks except around parts of the surrounding village area. As we are surrounded by forests and a river, kindly inform staff if you plan to either go into the river or have a walk outside of our premises so that they may be aware of your whereabouts. Due to the lack of a comprehensive public transport system in Brunei, especially in areas outside of Bandar Seri Begawan, we strongly recommend that you make transport arrangements with us for your convenience.If arriving at Brunei International Airport:1 - Take a public bus (purple in colour) from outside the Departure Hall on the 1st Floor (no fixed frequency, price B$1/pax/way) to the bus station in town, and from there, walk to the Kianggeh Jetty less than 200m away (if asking for directions, ask for how to get to where the speedboats leave for Temburong) OR, take a taxi from the Ground Floor Arrival Hall (cost B$25-30/taxi/way) to Kianggeh Jetty, Jalan Residency, Bandar Seri Begawan. Bus ride takes around 30-45 mins excluding waiting time, and taxi ride around 15-20 mins. Last bus at 5-6pm.2 - At Kianggeh Jetty, check with the 2 available boat counters for the next available boat departure (no fixed frequency, price B$6/pax/way). Go for the next available boat, and do so by filling in your full name, nationality, gender and passport number on the boat list, pay for your fare and get your ticket, and wait for the boat to depart. Boat ride will take 45-50 mins. Last boat at 4.30-5pm, earlier during fasting month. Give ample time as boat schedules may change without notice.3 - Upon arrival at the Bangar Jetty, ask at the boat counters for assistance to direct you to a driver or taxi. Negotiate and finalise the rate before boarding. You may also negotiate a return rate if you are sure of your departure date and time, but do not pay for this until the actual day. The usual rate ranges from B$20-40/car/way, and the ride will take around 25-30mins. Tell the person to take you to Sumbiling Eco Village, Kampung Sumbiling Lama.4 - Upon arrival, if possible get driver to assist you in getting all the way to our lodge on foot. If driver is unsure, you may get him to take you to the Sumbiling Lama longhouse instead, and ask a villager to bring you to our lodge. If you have booked in advance, we should be expecting you!